November 30, 2017 — Palestinian civil society has condemned Giro d’Italia for yielding to political pressure from Netanyahu’s far-right government by removing references to “West Jerusalem” on its website and using “Jerusalem” instead. This, Palestinian human rights campaigners argue, makes Giro “directly complicit in Israel’s propaganda claim” that Jerusalem is a “unified” city under its sovereignty, which is not recognised by the UN, the EU or Italy. The UN considers East Jerusalem as part of the occupied Palestinian territory and does not recognise any part of Jerusalem as Israel’s capital. Two Israeli ministers had last night threatened to withdraw Israeli sponsorship from the race unless organisers made official acknowledgment of Jerusalem as under Israeli sovereignty. 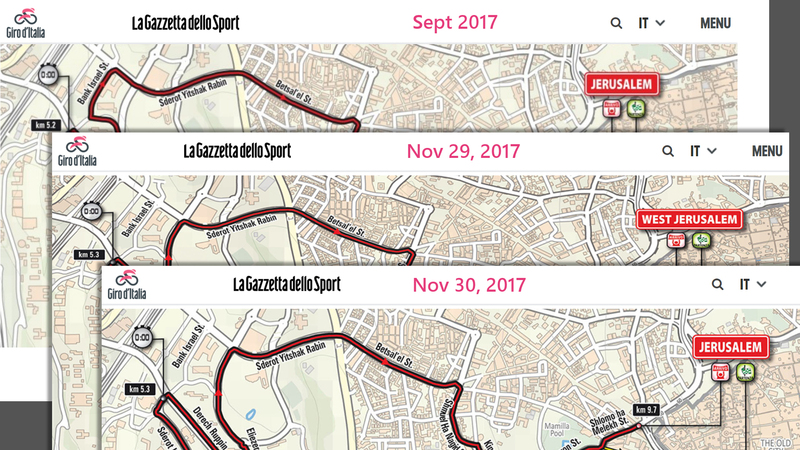 But within hours of the threats being issued, the race organisers edited the official Giro D’Italia website to erase the East-West distinction (as the before and after image shows), lending recognition to Israel’s illegal hold over occupied East Jerusalem. Keen on using Giro d’Italia to whitewash its decades-old occupation and human rights violations against Palestinians, Israel is reportedly paying €10 million to host the opening stage of the race, in addition to €2 million directly to top cyclist Chris Froome for his participation in the race. By threatening to withdraw sponsorship of the race over references to “West Jerusalem,” Israel offered Giro d’Italia an “exit strategy” to end its complicity in Israel’s violations of international law and Palestinians’ human rights. Giro d’Italia, instead, shamefully chose to bow to Israeli pressure and recognise Israel’s illegal annexation of occupied East Jerusalem, contravening international law and the Italian government’s own position. Giro d’Italia is reinforcing Israel's illegal claim of sovereignty over the city of Jerusalem, when no country recognises Israel's sovereignty over East Jerusalem nor any part of Jerusalem, East or West, as Israel's capital. The race organisers’ initial clumsy attempts to mitigate Giro d’Italia’s involvement in Israel’s crimes by adding “West” to the stage in Jerusalem did nothing to change the fact that one of cycling’s top races is complicit in covering up the actions of an oppressive government operating outside the rule of law. Giro d’Italia’s dishonest insistence on keeping politics out of sport has proven to be nothing more than lip service to deflect criticism for its acceptance of a large Israeli bribe in return for politicizing the race and using its name to whitewash human rights violations.. It is time for the Union Cycliste Internationale (UCI), the world cycling body which has remained on the sidelines from the start, to step in and take measures to avoid tarnishing one of the world’s most beloved cycling races. Giro d’Italia announced Plan B must be put into effect immediately by relocating the race. We hear Puglia is lovely in the spring. The Israel Cycling Federation sponsors and holds competitive races in areas under Israeli military occupation in violation of international law. Just days before the Giro d’Italia, the Israeli cycling team, which is up for a wildcard slot to participate in the Giro d’Italia, will participate in a race through occupied East Jerusalem to the illegal Israeli settlement of Pisgat Ze’ev. The Giro d’Italia is a UCI World Tour event.